Summary: This project will continue the Sea Turtle Friendly Practices educational campaign. This campaign was financed courtesy of a Sea Turtle Tag Grant, and involved development of educational displays, publications, and highway billboards. Environmental education centers, public libraries and other outreach organizations assisted with the dissemination of these educational materials and adopted the use of educational displays designed to teach the public “sea turtle friendly” practices. Featured recommended practices included reducing the effects of artificial lighting, removal/relocation of beach furniture at night, protecting/re-establishing sand dunes, etc. 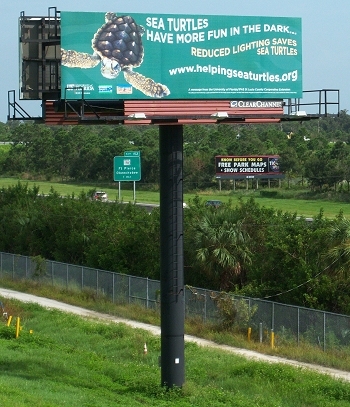 Highway billboards were erected along I-95 and the Turnpike featuring the Turtle Friendly Beaches message. The Turtle Tracks and Turtle Friendly Beaches publication will be reprinted. Displays will be made available to environmental education providers in Martin, St. Lucie and Indian River Counties. One highway billboard featuring a “Sea Turtle Friendly Beaches” theme will be produced. St. Lucie County owns four highway billboards in the right of ways along the Florida Turnpike and I-95. St. Lucie County will commit at least one billboard to the Sea Turtle Friendly Beaches public education campaign for a minimum of one month. Grant funding will be used to print and install the campaign vinyl on a highway billboard. Finally, four self-standing banner displays featuring a “Sea Turtle Friendly Beaches” theme will be created and displayed in heavily trafficked locations in Martin, St Lucie and Indian River Counties. Results: 1,175 people participated in Sea Turtle Friendly Beaches programs in 2011. Pre and post test scores for 26 program participants attending the presentation at the Manatee Observation and Education Center indicated that participants increased their understanding of sea turtle friendly practices. These scores are generalizable to the entire program population. Pre-test scores indicated that only 37% of surveyed participants could list at least 4 of 5 sea turtles found in St Lucie County. Upon completion of training, post test scores indicated that 100% could list at least 4 of 5 sea turtles found in St Lucie County. Pre-test scores indicated that only 54% of surveyed participants could identify the St Lucie County Sea Turtle Nesting Season as March 1 – November 15. Upon completion of training, post test scores indicated that 96% could list at least 4 of 5 sea turtles found in St Lucie County. Pre-test scores indicated that 27% of surveyed participants understood that St Lucie County sea turtle season lighting regulations state that “light cannot be directly visible from the beach and/or does not directly illuminate areas seaward of the primary dune from sunset to sunrise.” Upon completion of training, post test scores indicated that 77% of participants understood St Lucie County sea turtle season lighting regulations. Pre-test scores indicated that 35% of surveyed participants could identify at least four human-related threats to sea turtles other than light pollution. Upon completion of training, 81% could identify at least four human-related threats to sea turtles other than light pollution. Pre-test scores indicated that 15% of surveyed participants could identify three types of window treatments approved under St Lucie County sea turtle season codes: blackout drapes, shade screen, approved window tints. Upon completion of training, 73% could identify three types of approved window treatments.